In my previous article, we established that the iPhone's market share is heavily dependent on carrier subsidies. Now let's take a look how iPhone subsidies affect carriers and the potential impact this could have on Apple. Are iPhone Subsidies a Problem for Carriers? The most important thing by far is for Apple to continue making great products that customers want. And we are deeply committed to doing this and are innovating at a rate and pace that's unbelievable in this area. For -- from a carrier's perspective, I think it's important to remember that the subsidy is not large relative to the sum of the monthly payments across a 24-month contract period. And any delta between iPhone and maybe another phone is a -- an even smaller level of difference. 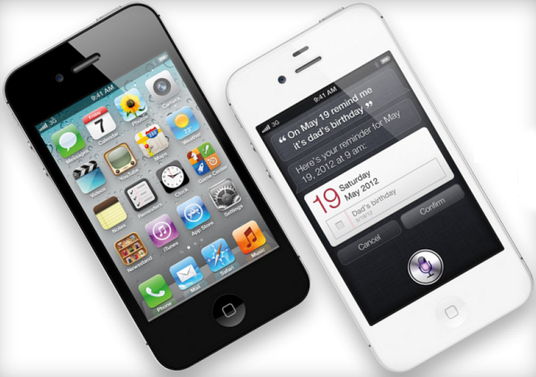 And the iPhone has some distinct advantages for the carrier over competing smartphones. For example, many of the carrier executives have told me that churn from iPhone customers is the lowest of any phone they sell in their whole -- in all of the phones they carry. And that has a significant direct financial benefit to the carrier. Also, our engineering teams work extremely hard to be efficient with data and differently than some others. And we believe that as a result of this, that iPhone has far better data efficiency compared to other smartphones that are using sort of an app-rich ecosystem. Finally, we think that the -- and this is the most important, is that iPhone is the best smartphone on the planet to entice a customer who is currently using a traditional mobile phone to upgrade to a smartphone. This is by far the largest opportunity for Apple, for our carrier partners and is a great, fantastic experience to the customer. And so there's a win-win-win there. While Tim Cook is one of the best CEOs in the world right now, I would rather not take his words at face value. So let's analyze his arguments and see if they hold any water. I've focused on the US market, as these trends would most likely hold good across the globe. Analyzing figures from AT&T and Verizon, for the last four quarters, can give us great insight into the financial impact of the iPhone. Since Sprint only began selling the iPhone in Q4 2011, it has been excluded from this analysis. The primary reason for the iPhone's dependence on carrier subsidies is that all iPhone models are high priced, high margin products for Apple. So even though a subscriber may get an iPhone 3GS for free or an iPhone 4 for $99 on a two year contract, carriers still have to pay Apple an average subsidy of roughly $400-$450 per device. Meanwhile, Apple's competition is diversified across price points, receiving an average of $200-$300 in subsidies per device. On average, it is safe to assume that the iPhone receives an incremental subsidy of $150 per device, when compared to competition. Based on the incremental subsidy per device and iPhone sales from AT&T and Verizon from Q2 2011 to Q1 2012, we can calculate the total incremental subsidy burden for these two carriers. Tim Cook may very well be right in his assertion that iPhone subscribers have a lower churn rate than those using competing smartphones. But according to Consumer Intelligence Research Partners (CIRP), the churn rate among iPhone subscribers is just 6% lower than other smartphone subscribers, which means the reduction in carriers' overall smartphone churn rate would be even lower. Now we need to understand the cost savings that carriers receive thanks to the iPhone and compare that with the additional subsidy burden. To calculate these cost savings, I have actually assumed that the overall smartphone churn rate of carriers reduces by 6% because of carrying the iPhone, which implies the churn rate reduction among iPhone users is assumed to be around 10%. This assumption actually favors Apple's stance more than Consumer Intelligence's findings do. There are numerous estimates of the cost of acquiring a wireless subscriber. According to one estimate, the cost of acquiring a wireless subscriber ranges from $300 to $400. Another estimate measures this cost at $250 to $300 per customer. A research report from 1998 also estimates this cost as $400. Since estimates seem to be fluctuating even over such a long time frame, we can make a safe assumption of the cost of acquiring a customer as the high end of the ranges mentioned here, i.e. $400. Most reports also mention that acquiring a new customer costs five times as much as retaining a current customer, i.e. $80. So, the incremental cost to replace a subscriber would be the difference of these two, i.e. $320. 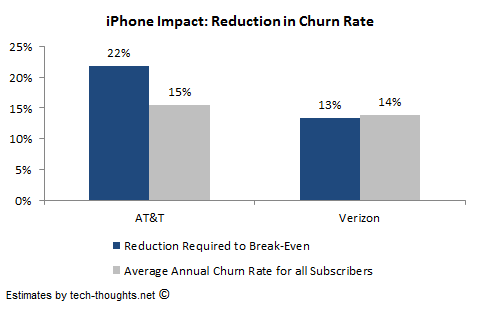 Now, using the figures above, in conjunction with the number of postpaid smartphone subscribers for Verizon (47% of 88 million postpaid subscribers) & AT&T (41.2 million postpaid smartphone subscribers), we can estimate the total savings carriers have gained thanks to the reduction in churn rate, due to the iPhone. The actual cost savings would be lower than this as the average size of the AT&T's and Verizon's subscriber base over the last four quarters would be lower than the size in the latest quarter. As the chart clearly shows, costs savings due to reduced churn is only 27% of incremental subsidy cost for AT&T and 45% for Verizon. This means AT&T is actually losing a net figure of more than $2 billion, while Verizon is losing nearly $1 billion, due to high iPhone subsidies. Verizon's gap is lower because it sold fewer iPhones than AT&T. This gap is so large that any realistic change in inputs would not affect the outcome by much. And the really scary part for carriers is that incremental subsidy costs would continue to outgrow cost savings as iPhone sales increase. Does anybody else see a problem here? 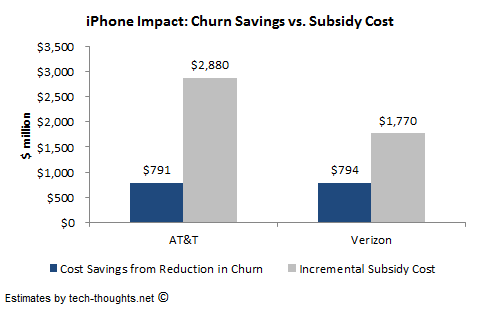 The required reduction in churn rate to break even on the subsidies is actually higher at AT&T and nearly equal at Verizon, when compared to the average annual churn rate for all subscribers (smartphones & feature phones). Given that both Verizon and AT&T have a monthly churn rate in the range of 1-1.5% for smartphone subscribers, the average annual churn rate for smartphone subscribers would be in the same range as in the chart above. Given these figures, it is practically impossible to achieve break-even under the iPhone's current subsidy structure. This analysis does not even take into account the fact that Android smartphones consume nearly 20% more data than iPhones (this seems to hold true even with iCloud and Siri). In the absence of "all-you-can-eat" data plans, which is where carriers seem to be moving, this would translate into a much higher average revenue per user (ARPU) figure from Android smartphone subscribers as compared to iPhone subscribers. Clearly, there is no incremental ARPU gained from iPhone subscribers that can even begin to balance out the incremental subsidy costs. Based on the analysis above, it is clear that Tim Cook's comments do not mean much from a carrier's perspective and that the iPhone's current subsidy level is unsustainable. The only positive is that iPhones use less data and hence, place less load on network infrastructure, but that results in lower ARPU as well. Can Carriers Really Reduce Subsidies on the iPhone? 1) The push started with US carriers increasing upgrade fees for customers who wanted to switch phones and increasing data subscription charges. 2) Verizon has told its subscribers that their current unlimited data plans will only remain available for customers who buy phones at full retail price, i.e. with zero subsidies. 3) AT&T made the boldest move, by announcing its intention to limit 2011 smartphone sales to 2012 levels, and most importantly push to reduce subsidies on phones it currently sells. Given that the iPhone accounted for 78% of AT&Ts Q1 2012 smartphone sales, that push is obviously going to be against the Apple. CLSA has argued that the presence of most favored nation (MFN) clauses in all of Apple's contracts with US carriers would mean that "US carriers would need permission from Apple to alter subsidy levels". To be honest, this argument doesn't make much sense. CLSA admits that the presence of an MFN clause implies that any offering to one carrier has to necessarily be offered to another. An MFN clause, by definition, ensures that if one carrier is able to negotiate better terms with Apple when their contract runs out, those terms are applicable to the existing contracts of the other carriers as well. The MFN clause in no way implies that you need permission implement the clause. Therefore, with AT&T's contract set to run out first, it would also be beneficial for Verizon and Sprint if AT&T was able to negotiate lower carrier subsidies from Apple. AT&T has made it very clear that they intend to reduce the iPhone's subsidy burden. Since AT&T is the responsible for the highest number of iPhone sales in the country and iPhones comprise a majority of AT&T's smartphone sales, neither AT&T nor Apple would consider walking away from each other. My guess is that both sides play hardball and eventually come to a compromise, resulting in a reduction of iPhone subsidies across all US carriers to a more manageable level. Apple's carrier subsidy reduction could either be implemented by allowing carriers to increase contract prices or by reducing margins on the iPhone. Tim Cook's decision could boil down to a classic volumes vs. margins debate. Conclusion - From the analysis above, it is clear the iPhone subsidies are not beneficial to carriers and seem to be unsustainable. Since the massive margins & volumes on the iPhone are the biggest reason driving Apple's high gross margins on a consolidated basis, any reduction could negatively affect Apple's stock price. As a non-iphone owner I feel like I am subsidizing the the iphone owners. I know it will never happen, but I wish everybody bought their phone outright. That's actually what's ending up happening. Spend less money on and make more money from non-iPhone smartphone owners. Sadly, I don't think carrier subsidies will ever go away entirely, but looking at carriers decisions lately a strong push for firm cuts is likely. I hope more carriers will follow Verizon's lead, i.e. unsubsidized purchases get unlimited date. When my phone is paid off I would like my monthly bill to drop. That doesn't happen. That's fairly unlikely to ever happen, given how subsidies strain carriers' margins. What you're describing is an unsubsidized sale that's paid off in installments. That's usually what happens in most emerging markets and a few European countries. That may actually be the best course forward, but I'm assuming we'll end up somewhere between there and the current situation. You thoughts are incomplete. Let me help you a bit. The ARPU PE iPhone user is much higher than other users. Neilsen's data disagrees. I haven't seen a single data point the corroborates your statement, but I have data that suggests that the iPhone has LOWER ARPU than that for Android smartphones. Please find me a data source other than "opinions". Go to AT&T quarterly conference archive. listen to them carefully. I get my info from the only place where they cannot lie becasue of SEC regulations. Nielsen, comscore and analysts just make up numbers. And by the way, look at the Virgin mobile prepaid iPhone plan, compare it with the subsidized AT&T and VZ plans, AT&T and VZ are making out like bandits. There is no way, they will not keep "subsidize" the iPhone. Where they talk about POSTPAID SMARTPHONE subscribers having lower churn and higher ARPU? And I suppose, since you don't have a data source, any data that doesn't conform to your view is "made up". What are you afraid of my comments, don't want to listen to AT&T CFO? I didn't flag it for review. I just approved it. And you may want to read my previous comments. Like I said, you don't have a leg to stand on. And I can't believe you just compared post paid to prepaid rates. Hilarious! You actually expect data rates for unsubsidized phones to remain the same as subsidized phones? Data rates for all subsidized phones (iPhones & Android phones) are similar and those for unsubsidized phones are similar. The very fact that you had to compare prepaid to postpaid rates proves that you have no data to back up your claims. On investor calls, you are free to express your opinion. 1) In the AT&T Earnings call transcript, there was absolutely no mention of iPhone ARPU. I posted it above, you can see for yourself. 2) Tim Cook has never said that iPhone ARPU is greater than Android ARPU. Even when he was talking about subsidies, he mentioned everything else but ARPU. I quoted him in this article. 3) There is no data to suggest than iPhone ARPU is greater than Android ARPU, but there is data that suggests the opposite. I realize that you are emotionally & financially invested in your belief, and you are free to do so. Best of luck with your stock positions. 2. there will be only two data plans - unlimited (but unsharable) for unsubsidized and a sharable high cap quota (2-4 devices) - with a slightly higher $ per GB. 3. there will only be one calling plan for smartphones, unlimited. 4. upgrade offers will be tighter -and more linked to TCV at account level, instead of a broad-brush milestone like 18 months and heftier upgrade fees will apply more stringently. 4. AT&T and Verizon will eventually settle on selling only as many iPhones as they sold in the previous year, normalized for overall smartphone growth. Maybe a little more, but not a whole lot more. The gallop is over and homeostasis is resuming. Carriers will invest their extra energy in diversifying to platforms that make them the same amount of money, or more, for less subsidy. This has significant implications for Apple, because they may cease to outgrow the smartphone market in the tapped out developed markets where carriers and consumers have the deepest pockets. Much as they may wish, the economic dynamics in emerging and prepaid markets are just not the same because one can spend only x% of disposable income on mobility before x becomes too much to justify. It's refreshing to see a such a well thought out argument regarding Apple. I completely agree with all your points. T-Mobile USA has been vocal in advocating for precisely that: a no-subsidy, installment-plan model for the industry. They're the US subsidiary of a European company, so they see how much better it works when the carrier isn't in the position of subsidizing devices so heavily. Unfortunately, only T-Mobile USA seems interested in such a model. It's kind of a tricky situation. In an ideal world, all carriers would pull off subsidies. But everyone's scared that a competitor may retain subsidies and you'd see a huge exodus of subscribers to that company. It's a classic prisoner's dilemma. It's best for the whole industry to stop subsidies entirely, but that fear will prevent it from happening. From my own personal perspective (no data) I see that iPhone owners usually sticking with the iPhone while those who use Android or any other type of device swapping them out whenever they can get away with it. I'm surprised that the numbers are so high! That's just the conundrum, isn't it? If consumers are ready and willing to shell out money, the carriers don't really need to bear the brunt. Demand and price should be directly related, which makes this a market anomaly that needs to be corrected. relation to a period of time (i.e. monthly churn, annual churn, etc.). on applying the word "churn"). Finally, read the qtrly transcripts; You'll read churn rates are far lower on iPhones (0.7% monthly) vs. non-iPhone-Smartphones (1.2% monthly), that's 40+% better, far larger than the CIRP 6%. Instead of running a top-down analysis, run the analysis the way the industry does, on a per subscriber basis: ARPU of $90, margin of 60%, 24 month contract, that's $1296 of contribution; discount this back, it's still far larger than the subsidy and marketing CPGA. 1. You'll notice I used CIRP's figures as a reference, but my churn rate assumption was far more generous and as per the traditional definition. Your figure of 0.5% monthly churn reduction (1.2% vs. 0.7%) implies 6% on an annual basis whereas I assumed 10%. 2. The subsidy burden is not a one time cost. A carrier makes continued sales on an on-going basis, which makes subsidies a recurring cost. In the same way retaining a subscriber is also recurring, but not exponential (subscriber base is limited). Therefore, comparing these on an annual basis gives you a more meaningful analysis than a per subscriber analysis. 3. Again, the per subscriber analysis is meaningless in this case because we aren't calculating contribution at all. We're calculating comparative incremental cost on the iPhone vs. non-iPhones. Pretty much any smartphone will show an overwhelmingly positive contribution. I've quoted carrier executives' comments against subsidies for a reason. Sameer I appreciate the thoughts, but sorry to see bad analysis yet again. 1) A 0.7% iPhone monthly churn vs. 1.2% android is not a 0.5% monthly reduction (nor 6% annualized)...its far better than 40%, far better than your 10%. Let me show you differently to help: 0.7% iPhone monthly is a tenure of 143 months (1/.07). Android monthly churn of 1.2% is a tenure of 83 months. Thus an iPhone sub is stickier by 60 months (5 years!). 2) The subsidy is burden is one-time to acquire the customer; the "continued sales" aspect is for additional NPV-positive business and yields operational benefits in later months. If the carriers decide to pull the plug and stop selling, every metric would vastly beneficial, margins would be insane and CF would be through the roof, but they sacrifice this to acquire more iPhone subs because these subs are more valuable, driving these benefits. 3) Subscriber analysis is not only meaningful but actually the only way to look at it. If you want to compare incremental cost of iPhone vs. non-iPhone, then compare NPV per iPhone sub vs. NPV per Android. Every smartphone has positive contribution but the iPhone has MORE contribution (more NPV), that factors in the heavy subsidies. 4) Carrier executives are against subsidies? Yes, because they prefer spending less as opposed to spending more (who doesn't?). They look out for shareholders and fight every fight. But at the end of the day, executives express opinions with their spending choices, and they are spending heavily to acquire iPhone5 subscribers this month. 1) We are measuring the absolute reduction in churn rate, not relative because we've based the analysis on cost savings garnered through this reduction in relation to a carrier's total subscriber base. A 40% input would yield a vastly incorrect result vs. a 10% input. While your comparison is valid, the application in this instance is not. 2 & 3) Your point is valid, but it's based on the fact that iPhone ARPU is vastly above non-iPhone ARPU. While the Neilsen's data usage figures I've quoted dispute that fact, let's assume this to be true. What are the key drivers of ARPU? Is it the device itself or is it user demographics? It would be a combination of the two and demographics play a larger role when the devices (& ecosystem) are comparable (a Blackberry wouldn't be comparable). If the iPhone has higher ARPU vs. high end Android handsets, it would be caused by demographics. Here's an example: Consumer A has an income of $100K and uses an iPhone 4S with an ARPU of $100/month, Consumer B has an income of $50K and uses a Galaxy S2 with an ARPU of $50 per month. If Consumer A were to move to a Galaxy S3 and Consumer B were to move to an iPhone 4, you wouldn't expect a major change in their usage or ARPU. The only difference would be from whichever OS is more conservative with data and that's Apple's based on Tim Cook's statements. The revenue side is highly dependent on demographics, which is why comparing NPV of devices could be flawed. This is why I've focused on the cost side. 4) That's the whole point, isn't it? It seems like we're arguing semantics at this point. The analysis focused on incremental subsidies vs. incremental cost savings. In essence, they need to be in line with each other. My conclusion is not that carriers need to dump the iPhone (in fact, I've stated that they need it) and the user demographics confirm that. It's just that subsidies need to be reduced to market norms, that's what carriers are attempting to do and this is the reason why. Also, carriers can't do it immediately because of the nature of their contracts with Apple. "AT&T’s (NYSE:T) stock depends on the iPhone and how future smartphone data revenues trend. We estimate that AT&T’s mobile phones and wireless plans (including data) constitute about 43% of AT&T’s stock value and that about 25% AT&T’s mobile revenues are attributable to the iPhone." That's probably true. Which is why I haven't suggested the carriers drop the iPhone. That would be suicidal. This post just highlights the impact of the incremental subsidy expenses. Based on comments from carriers, they seem to be thinking along these lines as well. I think T-Mobile's move to drop subsidies this year will make for an interesting case study. Here is a great quote.. In some industries, reducing customer defections by as little as five points – for example, from 15 percent to 10 percent – can double profits. Looking at the white paper, that quote doesn't seem specific to the wireless industry (even though the paper is). That certainly makes sense in B2B industries where the value of individual customers is extremely high (as a result, customer acquisition costs are astronomically high). The data I've used is not only specific to the telecom industry, but specific to US carriers acquiring contract customers. When does AT&T's subsidy agreement with Apple run out? That really is the million dollar question. Unfortunately, it's not public information.